Matt Bonner was one of the greatest scorers in Florida basketball history. By the time he graduated in 2003, he had scored the eighth most points in school history. Only two players have surpassed his 1,570 points since. 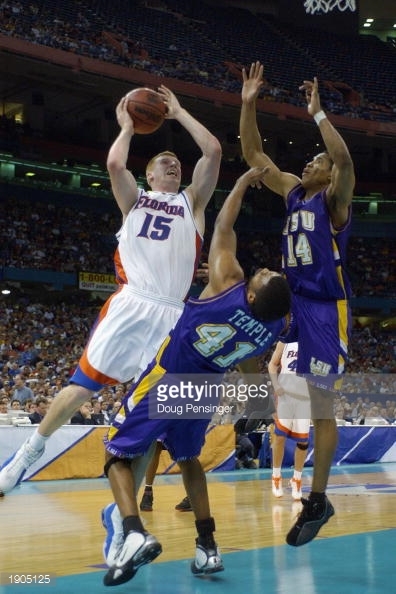 Bonner was also an excellent rebounder at Florida, finishing with 778 in his career. Bonner was a first-team SEC selection in 2003, and was also named an honorable mention selection as an Associated Press All-American. Bonner was traded to the San Antonio Spurs before the 2006-07 season. Bonner won two NBA titles with San Antonio. Bonner was the runner up in the 2013 All-Star game three-point shootout. Bonner finishes his career averaging 5.8 points and 3 rebounds per game. Bonner is a career 41 % 3-point shooter. Best of luck to Matt Bonner in all of his future endeavours. Once a Gator, Always a Gator!